What do an air conditioner running in the winter, a bottleneck in an IT storage network, an overdue trucking delivery and an outage at a cellular communications tower have in common? Each is a problem that needs to be located. Each needs to be resolved as quickly as possible. Each can cause unecessary expense and potentially lost revenue. These have always been true. But today there's something else. 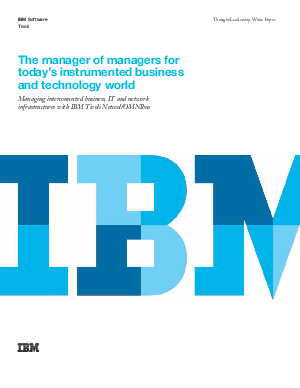 IBM® Tivoli® Netcool®/OMNIbus is a "manager of managers" designed to collect and correlate events from a broad spectrum of infrastructures. It provides a "single pane of glass" view into the health and performance of the entire IT and business infrastructure, integrating and consolidating tools and events across business, data center and network operations.